Colour Alike 513 to byl maj | Light Your Nails! Oggi vi mostro lo smalto che ho usato come base per la mia nail art blu e verde. Se vi ricordate ero partita da una sfumatura da azzurro e verde acqua. 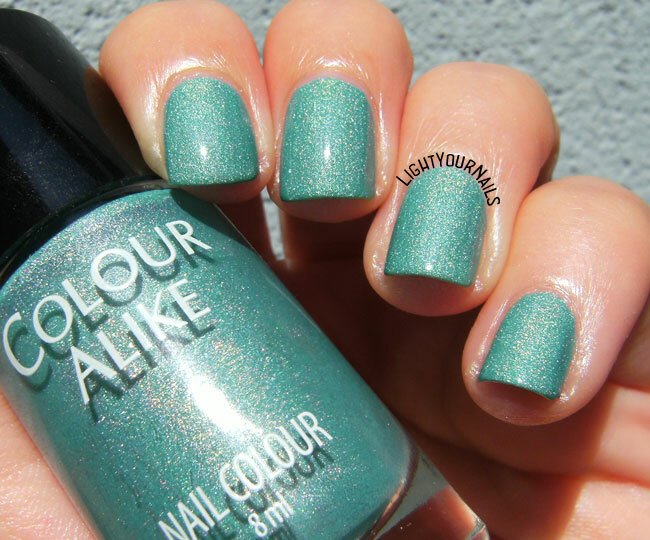 Lo smalto azzurro lo avete già visto qualche secolo fa >Colour Alike 512<, oggi è il turno del verde acqua. Come il 512, anche lo smalto Colour Alike 513 è uscito con la collezione di olografici pastello del brand polacco. Si tratta di uno smalto olografico del tipo che non crea un arcobaleno sulle unghie. Il colore è un bel verde acqua con una punta di blu. La stesura è una favola, come tutti gli smalti Colour Alike che ho provato finora. Today I am showing you the nail polish that was the base for my When Colors Collide’s blue and green nail art. Maybe you remember I started from a pastel blue to aqua green gradient. I’ve already blogged the blue polish ages ago >Colour Alike 512< and now it’s time for that aqua green. Same as 512, Colour Alike 513 was released with the Pastel Holo collection by Polish brand Colour Alike. It’s a scattered holographic nail polish, which means it won’t create the famous prism, or rainbow, on the nails. Colour is a lovely aqua green with just a hint of blue. Application is a dream, as any other Colour Alike I’ve used so far. Io lo trovo veramente stupendo, perfetto per il bordo piscina magari! Sotto vi lascio anche una foto che ho fatto in casa, quindi non al sole, anche in quel caso è bellissimo. Gli smalti Colour Alike si comprano online direttamente dallo shop del brand www.colouralike.com e costano 5€, anche se io sono sicura di averli pagati meno qualche anno fa. 5€ è comunque un buon prezzo secondo me. Cosa ne pensate di questo smalto? Non è un colore meraviglioso? I find it awesome, perfect for a pool party maybe? Below you can see an indoor photo, it’s lovely that way, too! You can purchase Colour Alike nail polish at www.colouralike.com at 5€ each. I am pretty sure I paid them less than that a few years ago, but it’s still a good price. What do you think of this colour? Isn’t it gorgeous? Yes! And it's easy to understand why! I am glad I am not the only one who remembers they were cheaper! Oh my---I love this color!! Ele é muito bonito desde o vidrinho.... gostei. I really love this type of shade! Thank you Kerry! Pastels don't look good on me, but I can wear anything as long as it's holo! This is such a pretty colour - perfect for a Caribbean ocean! This is a very pretty color, and looks great on you. Ive never heard of this brand but it sounds like they are good quality and one I should be on the lookout for if I get the chance. Colour Alike is very popular among European bloggers! Totally worth trying! That is a gorgeous color!! It looks great on you! I adore these kinds of green! Ne vale la pena! Sono smalti belli e molto buoni!